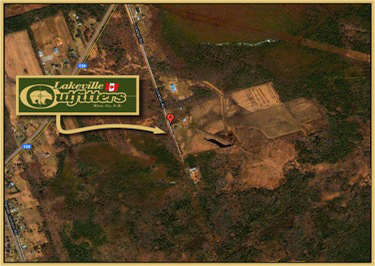 We are an established guide service located on the outskirts of Moncton New Brunswick, Canada. We are just twenty minutes from downtown Moncton, which offers a variety of restaurants,shopping, theatre and sports facilities to suit every taste. Our guided hunts are conducted on private and crown lands. We will do our utmost to ensure an outdoor experience that will be among the safest and most gratifying experience by providing excellent accommodations, a proven network of hunting areas as well as courteous and professional guides, all of whom are able to offer bilingual (english & french) services. Lakeville Outfitters' cooks will provide excellent home cooked meals and desserts including a variety of local Acadian cuisine sure to add to your experience and enjoyment. We invite you to view our various big game hunting packages along with the photo gallery showing the many successful hunts that we have enjoyed and which can also be made available to you.